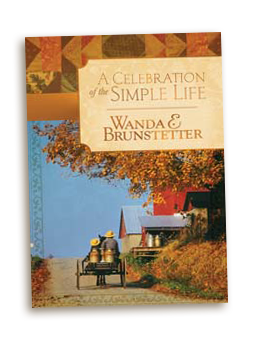 Join Wanda in celebrating the simple life of the Plain People! Pairing devotional readings and Scripture from the KJV with her original poetry, this gift book encourages you to reflect on your attitudes, responsibilities, and Christian duty in light of the Amish philosophy of simplicity. A breath of fresh air for those under stress! One of the things I most admire about the Amish way of life is their dedication to keeping true to their faith. While the Amish and other Plain groups would be the first to admit that they aren’t perfect, their simple way of life and deep faith in God provides us with a model of how we might simplify our lives to live better physically, emotionally, and spiritually. The Amish way of life offers us ideas on how to live a slower-paced, satisfying life with less dependence on modern things, and more emphasis on God, family, and friends. For this reason, I chose to write a devotional where I could share some of the experiences my husband and I have had during our many visits with Amish friends. These visits have not only drawn me closer to the people I’ve come to know and love, but they’ve given me a deeper understanding and appreciation of God’s amazing love. Be inspired. . .or inspire someone else with this brand-new title joining the Life’s Little Books of Wisdom series. This little book is overflowing with inspiration and encouragement. Attractive package for portability and packed with relevant quotations, thoughts, and scripture. Perfect for your own personal use or as gifts, this charming book is sure to make a lasting impact. There are lessons to be learned in Amish country, if we’ll only take the time to hear them. Come along for a look at The Simple Life, with 60 true-to-life Amish stories, and 60 delicious Amish recipes.A hard-backed version with color photos. Have you ever felt like your life is too busy, too cluttered, too stressed? Have you ever imagined a simpler life, full of the blessings of family, friends, and faith? I wrote The Simple Life devotional for everyone who’s ever longed for a less stressful, more peaceful existence. 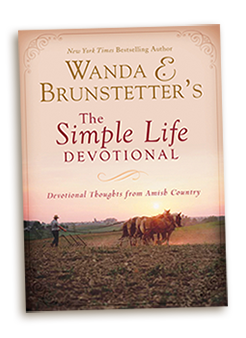 Based on stories from my Amish friends, the devotionals I included provide practical and thought-provoking ideas on living a more satisfying life. Yet, one need not wear plain clothes or drive a horse and buggy to find a simpler life. Quietness and peacefulness are really a matter of the heart. It’s my hope that each reading will give you an intriguing glimpse into the Amish culture and help you discover a sense of peace, joy, and a desire to live life a little closer to God. "A Celebration of the Simple Life is a wonderful way to take time out for yourself, realize what is important, and live your life in a Godly presence. Each one of the poems will bring a smile to your face as you rejoice in all that is pure and good in the world. With each book I read of Wanda E. Brunstetter I am fully convinced she is an author that offers the very best of her abilities for her fans reading pleasure. There is no doubt that her skill is unsurpassed. If this is your first experience with this author rest assured that it definitely will not be your last. For her words have a way that magically weaves each one of them around your heart." 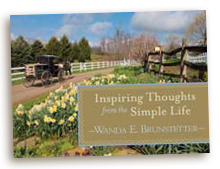 "In her newest devotional book A Celebration Of The Simple Life Ms. Brunstetter shares some of her experiences with her Amish friends along with some beautiful poetry, devotionals and prayers in a collection that should and will encourage most to live the simple life. Along with some beautiful photography this is a book that will be read not just once but again and again. It does not matter what church or denomination that one belongs to we are all one in the eyes of God and this little book will be an inspiration to all. Life is hectic and we should all take note, sit back and relax and enjoy the Simple Life."